OK, maybe you'll guess it if you look at the main image on this article. But if you're like many of the millions of people with the Internet who also go on vacations, there's a good chance you've stumbled on the hivemind that is TripAdvisor. Sometimes, you just need a consensus. And the travel ratings website just released its list of the top-rated cities in the world for 2015 -- to surprising results. The city with the most green bubbles (TA's equivalent of stars)? 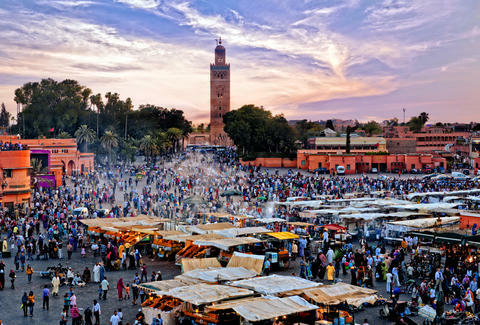 Marrakech, Morocco, with its abundance of bazaars, elaborate palaces, and amazing street food. If you’re not into sipping mint tea or making hash, the second-best destination is Siem Reap, Cambodia, where you can visit magnificent ruins like Angkor Wat, explore jungle land, and sample tasty sweet-and-sour cuisine, all for under $50 a day. Dethroned from being no. 1 last year, Istanbul, Turkey lands in third place, with a string of markets hawking everything from local cuisine to clothes, and architectural marvels like Hagia Sophia that serve as a portal to the city’s fascinating past. Surprisingly, big-name European cities like London (no. 6), Rome (no. 7), and Paris (no. 9) took a backseat to Asian and African destinations, with Prague being the only EU city in the top five. Must be all the cheap pivo (Czech for “beer”). And while no US city makes the top 10, New York City took 11th place and, surprising no one at all, held the top spot in the US rankings. Head here for the full results.